All partners that distribute their products on Skyscanner have access to the unique analytical tools that empower them to monitor and assess performance in the market, help make strategic decisions and increase revenue all housed within our dedicated Partner Portal. The portal provides a variety of different features that help our partners get all the necessary data to make great business decisions. 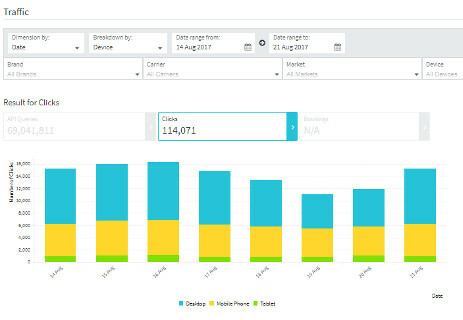 Our Traffic performance dashboard is one of these features, which provides unique insights into traffic performance across a variety of different devices. The dashboard allows users to see data on clicks from recent months and breakdown the traffic by device or market. The Traffic performance dashboard brings a variety of benefits to our Partner Portal users. It has the potential to help uncover performance strengths and weaknesses, and identify possible opportunities. Partners are able to determine through which device users are coming to make a booking. For example, if there is an increased amount of exits via mobile, they can decide to accelerate growth via improved mobile on-boarding, get quick wins through mobile optimisation, or validate the value of a mobile-led campaign, the opportunities are endless. Additionally, the data that is available on the Partner Portal is fully visualised, which makes it easy to see what’s happening at any time and take actions if needed. Partners can easily export the data whenever they need to and benefit from the opportunity to see all the necessary stats at a glance. Interested to find out about other features available on our Partner Portal? Click here to read about our Partner Quality Score. Newer PostUnserved Routes: Six European Pairings Now Live!